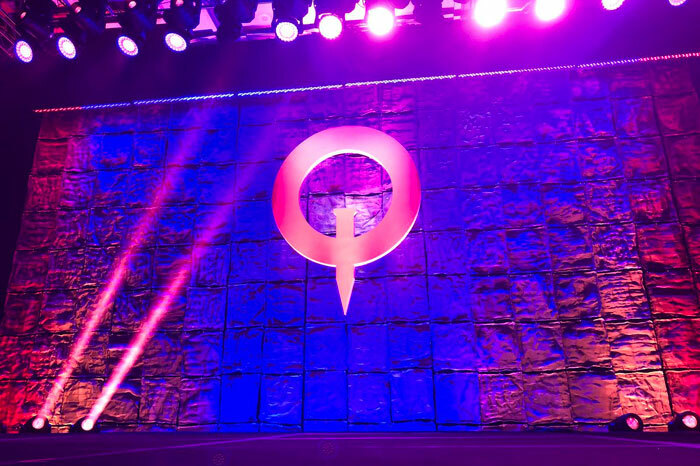 QuakeCon 2018 ran from Thursday 9th August and finished last night. Bethesda discussed and showcased various AAA games, shared all-new videos, and made some major announcements. However, the Bethesda news dominating the news headlines this morning appear to be due to a storm-in-a-teacup resulting from its heavy handed take-down of an individual's used PS4 game sale on the Amazon Marketplace. At QuakeCon 2018 a 17-minute DOOM Eternal gameplay video was shared and you can find it embedded directly below for your convenience. Two diverse worlds are showcased; Hell on Earth and Phobos. In this highly anticipated sequel to DOOM you will benefit from a redesigned set of armour, and an arsenal of new equipment. Furthermore, you can take on twice as many demons in DOOM Eternal, including fan favourites from classic DOOM titles like the Archvile, Pain Elemental, and the Arachnotron. The new DOOM will run on id Software's Tech 7 engine with "every environment brought to life in unprecedented detail". Expect to be able to purchase this game on PC, PlayStation 4, Xbox One and Nintendo Switch - but we don't have a release date as yet. RAGE (2) fans will appreciate the new extended gameplay demo presented at QuakeCon and embedded below. Viewing this video you will get a taste of the "incredible combination of action and scale" and lots of explosions. The video above shows plenty of open world action from the perspectives of both the Goon Squad and the Immortal Shrouded factions. You will see that the action seems to be split pretty evenly between brutal FPS gaming and vehicles /convoys. Other significant news from QuakeCon was that Quake Champions became a free to play game, the Isle of Madness story expansion for The Elder Scrolls: Legends was announced, and the Fallout 76 Perk System was outlined for those interested. Last but not least, there was some controversy this weekend after it was reported that Bethesda had hired lawyers to stop an individual selling a second hand copy of The Evil Within 2 (PS4) on the Amazon Marketplace. The fuss was all down to the individual describing his new, unopened, and still shrink-wrapped but unwanted copy of the game as 'new'. Bethesda's legal letter asserted that only authorised resellers can list stock as new and the listing would have to be removed or the individual face legal action. In a statement about the matter Bethesda explained "We do not allow non-authorised resellers to represent what they sell as 'new' because we can't verify that the game hasn't been opened and repackaged. This is how we help protect buyers from fraud and ensure our customers always receive authentic new product, with all enclosed materials and warranty intact." It come on Steam or Bethesda going get my middle finger where the sun don't shine LoL. It better come on Steam or Bethesda going get my middle finger where the sun don't shine LoL. Rage 2 looks so different from the first one, without all them popping textures.